The Black Mountain College Historic District, currently known as Camp Rockmont for Boys, is located three miles from Black Mountain. Six hundred acres, a portion of the original tract, is primarily meadowlands of the Great Craggy Mountains, which is divided by a creek that feeds Lake Eden. The site was first developed in the early 1920s by E. W. Grove as an amusement center and included four summer lodges, a round stone house, a dining hall and two stone cottages. 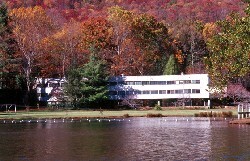 When the resort business dwindled, Black Mountain College purchased the property in 1937. Founded earlier in 1933 at the Blue Ridge Assembly, the college was established at its new site by 1941. 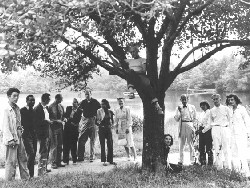 The experimental Black Mountain College was internationally known for its modernist advancements in American art and education. The college faculty and students were leaders of the day and included architect A. Lawrence Kocher; composer John Cage; Bauhaus artist and professor Josef Albers; artists Willem and Elaine De Kooning, and Franz Kline; and poet Charles Olson. The campus was enlarged with the construction of new buildings designed and built by the faculty and students, most notably the Studies Building, built in 1941 by Kocher. Initially, Bauhaus architect Walter Gropius was commissioned to design the building; however, the cost estimate far exceeded the college's budget. College President John Rice asked Kocher to design a more economical building. After consultation with Gropius, he planned a four-part facility that could be built in stages; only the first section was completed. Other buildings constructed for the college include the Jalowetz Cottage, Minimum House and Cabin 24/25, which are a notable collection of International Style architecture. Additionally, the faculty and students designed and built the farm buildings and Quiet House. After the outbreak of World War II, most of the male students and faculty left the campus, resulting in financial struggles and a change in the emphasis of study from visual to literary arts. By the 1950s, Black Mountain College, like many other experimental American institutions, struggled to exist. In 1957, the campus was sold to Camp Rockmont for Boys. The Black Mountain College Historic District is visible from North Fork Rd., off old Rte. 70, three miles west of Black Mountain and 15 miles east of Asheville. For more information call 828-686-3885 or visit Rockmont.